I debated what my first recipe should be on this little cooking adventure of mine. I went back and forth between whether I should make one of the recipes I made up in Chiang Mai (because I already knew what I was doing) or whether I should try something new to possibly give you guys a crazy story of mishap and a burned down kitchen. In the end, I decided to choose a recipe that I truly love … something that I would love to eat and that I knew every one of you would enjoy as well. Chicken with Coconut Soup is the very first recipe I made up at the Chiang Mai cooking class and it was by far my favorite thing I ate that day. It is a savory combination of classic vegetables with a few unique Thai tastes to give it a unique flair. Every bite of this soup hits just the right spot and leaves you wanting more. My experience cooking this dish for the first time wasn’t exactly … smooth. So my adventure started at the supermarket. I was going to hit up the Saturday morning market and do this recipe traditional Thai style (shopping and all), but in all honesty, I didn’t want to wait until Saturday to cook! 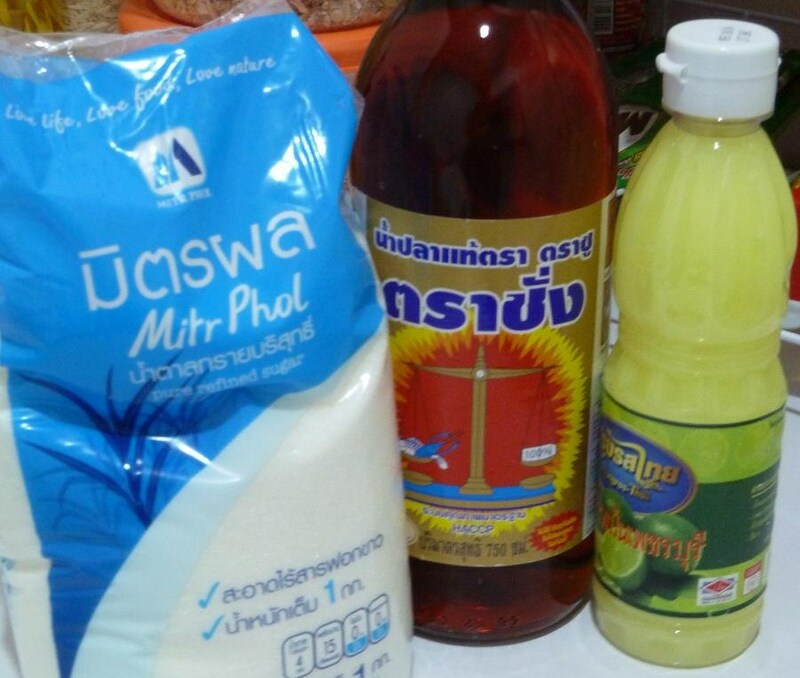 So, I went to the local Tesco, the Thai equivalent of Walmart in the states. They have everything so I knew I could hit the ground running. I picked up all my meats and veggies, some of the seasonings, and was ready to go. I will say though, Kaffir lime leaves seem to be just as difficult to find here in Thailand as they are in the states! You can’t find much of them in the states because the limes themselves are not USDA approved for growing. They are abundant here in Thailand (they are a key ingredient in any curry) but Tesco didn’t have them! Well, they did, but they were in a package of all ingredients to make a basic Thai curry. I had to buy the whole set, which means I’ll be making curry sometime next week (not such a bad thing). I need to visit the local market though to see if these leaves are more conveniently available somewhere. Alright, now it’s on to cooking. I am somewhat happy to report that this cooking experience went off without a hitch! Well, except for cutting up the chillies and then rubbing my cheek. I still have a burning sensation just below my eye and it’s about an hour later. Be careful people; chilies are serious business. So, since there aren’t any crazy experiences to throw in, I’ll just get straight to the recipe. Read on and then give it a try! Can’t wait to see how this turns out for all of you. A nice warm bowl of Tom Kha is great on a cold day! Prep is key to recipes like this since the cooking part actually moves pretty quickly. Have all of your ingredients prepped prior to starting. It’ll make your life so much easier! A tip: Split your ingredients into groups so you don’t accidentally add something at the wrong time. Not that big of a deal, but it’ll make for a smooth process if you have things separated. Plate One: These are all of your flavor enhancers. These are not actually intended for eating. You can if you want to, but I wouldn’t recommend it. Yuck! These will be your first set of ingredients to add. Plate Two: These are the ingredients you add second. They need a bit of time to cook. They also will soak up all the flavors from the pot so the longer they are in, the better. Plate Three: These are your final touches. 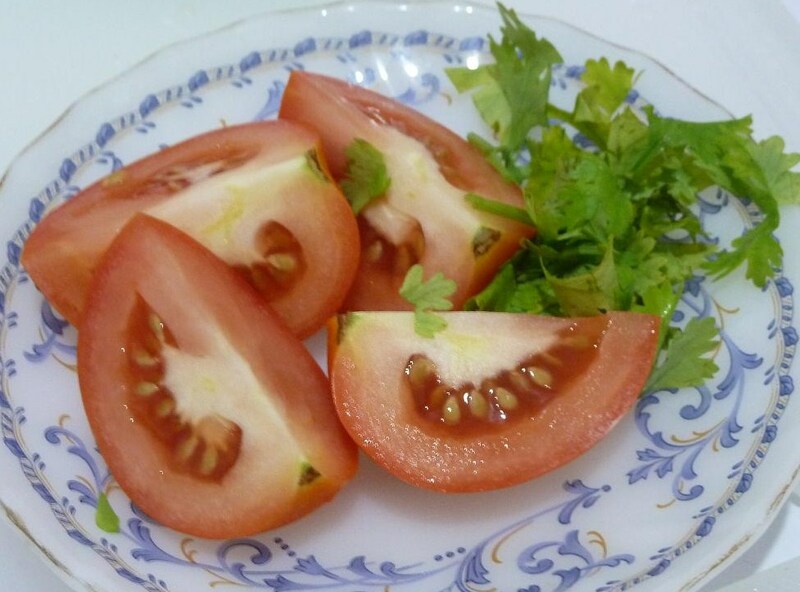 The tomatoes will be the last ingredient you add while cooking. Cooking them too long makes them mushy. The coriander is added at the very end once in the bowl. Seasonings: These are added at the last minute to create the final taste you want! 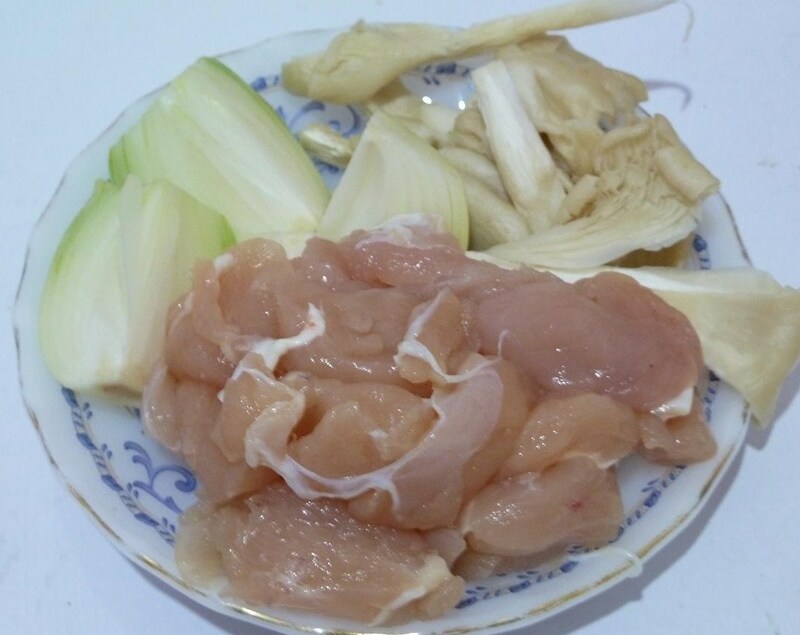 Lemongrass: chop off the top and throw away; chop remaining piece in half, double up, chop in half again. If it still seems too big, cut a little bit smaller. Chillies: chop off the top and throw away. Bruise the chillies using the flat side of the knife. Push down on the chillies until they pop a little bit. The more you bruise, the more spicy (because the seeds will start to come out). Kaffir lime leaves: fold in half, pull out the center stem, throw stems away. This releases the flavors from the leaves when cooking. Galangal: slice off two or so pieces a centimeter or two in width. 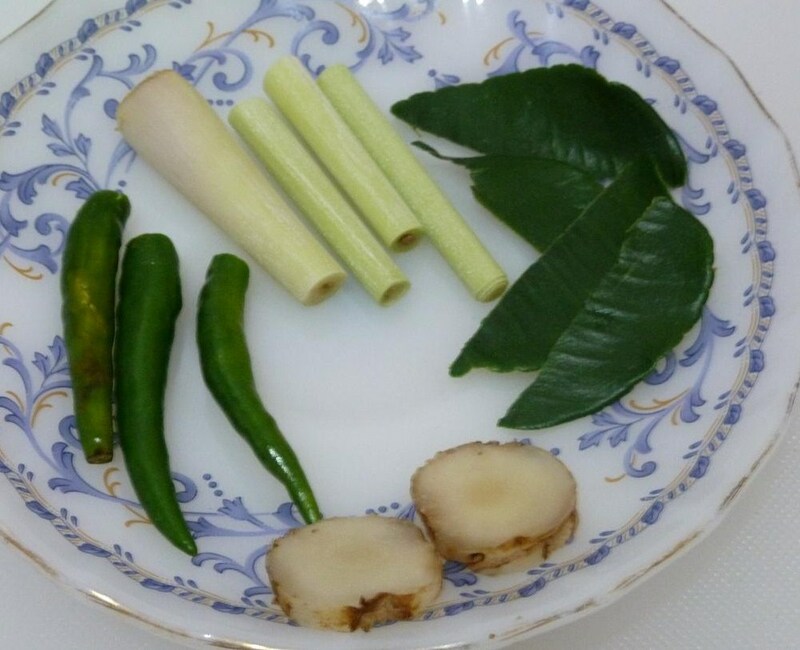 If your piece of galangal is large, cut the circles in half. Mushrooms: Use whatever type of mushroom you like, but break up into fairly large but bite-sized pieces. 1. 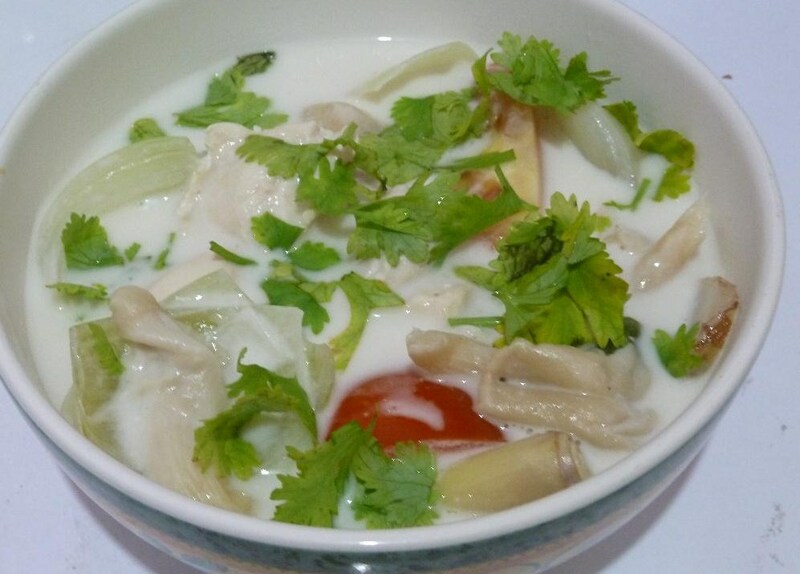 Add coconut milk, lemongrass, galangal, kaffir lime leaves, and chilies to a pot and bring to a boil. Continue to simmer until aromatic. Notes: You want to be able to smell the lemongrass, kaffir and chilies. Don’t be afraid to allow this to simmer for a few minutes. The longer you wait, the better the flavor. Just don’t keep the heat too high or the coconut milk will overcook. 2. Add chicken, mushrooms, and onions. Allow to cook thoroughly. Notes: The onions are the part I like to keep an eye on during this stage. You don’t want the onions to be crispy at the end so give them time to start peeling apart and softening up. This might take a few minutes. Also be sure the chicken cooks thoroughly. 3. Add tomatoes and allow to cook for about 1-2 minutes. 4. Add fish sauce, lemon/lime juice, and sugar to taste. Add chili paste to taste. Notes: Don’t be shy with the fish sauce. Yes, it smells terrible and tastes awful on it’s own (in my opinion) but when used in cooking it adds a great salty flavor. Don’t skip this! Also, it’s all about the chili paste! I didn’t have it when I cooked this time, but adding it at the very end will give it a nice hot/sweet combination. It’s what makes this entire soup for me! 5. Turn off heat, place in bowl, and sprinkle with coriander. Serve. I didn’t let the soup simmer long enough on the first step. I was anxious and hungry and the flavors didn’t come out enough. Next time, another couple minutes. I didn’t have chili paste! Honestly, this is the secret weapon of this recipe. It’s still really great without it, but a touch of paste at the end can go a long way. Never again without it! Well, there you go! Give this recipe a shot. You won’t be disappointed! And send me pics, stories, questions, etc. I’m starting a submission page of people’s attempts at these recipes … don’t be shy! this looks awesome… i’m going to give it a shot! Definitely tasty, Jeannine! If you try it, let me know how it turns out!